Dress up almost any meat course with Bacon N' Cheese Stuffed Potatoes. 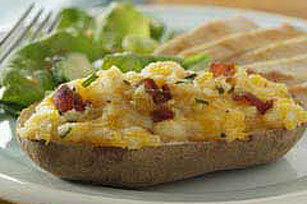 Our stuffed potatoes are twice baked with, you guessed it, yummy cheese and bacon! Pierce each potato in several places with fork or sharp knife. Bake 1 hour or until tender. Cool 5 min. Cut potatoes lengthwise in half; scoop out centers into medium bowl, leaving 1/8-inch-thick shells. Add cheese, butter, milk and pepper to potatoes in bowl; mash until desired consistency. Stir in bacon and chives; spoon into potato shells. Place in shallow baking dish. You'll know it's a special occasion when you get to enjoy a satisfying serving of these bacon-stuffed twice-baked potatoes. Garnish with additional chopped fresh chives before serving. Pierce potatoes; place on paper towel. Microwave on HIGH 9 to 10 min. or until tender, turning over and rearranging every 4 min. Stuff potatoes as directed; place in shallow microwaveable dish. Microwave on HIGH 2 to 3 min. or until heated through, turning dish after each minute.